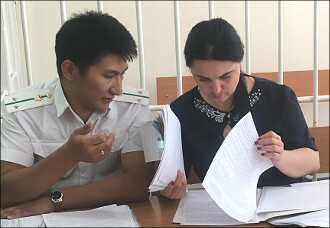 Judges of the Oktyabr district of the capital of Kyrgyzstan decided to consider three lawsuits of the Prosecutor General against the Bishkek information resource Zanoza.kg, journalists Naryn Idinov (Ayip) and Dina Maslova on the same day - 29 June. This desire of judges caused misunderstanding and dissatisfaction from the part of the lawyers of the publication. Lawyers rightly believed that they were placed in a very strict framework, in fact, deprived of the opportunity to become acquainted with the case materials. Lawyer of the public “Institute Media Policy” fund Altynay Isayeva in an interview with Fergana told in details that there were already eight court hearings in two days on hearings of the Prosecutor General's Office on the protection of the honour and dignity of the president. Lawyer Hurnisa Mahadinova in an interview with Fergana told that there are cases in the court practice when the same parties participate in the same cases when they are appointed on one day and considered one after another. Fergana tried to learn the opinion of pro-government experts, political scientists and journalists on the fact of judicial reprisal of the edition and journalists who dared to express dissatisfaction with the work of the head of state. Unfortunately, and not surprisingly, only silence and ignoring of our questions were the answers. Honestly, nobody expects a different reaction from them. However, it is likely that after the publication of the article they will start screaming out loud that we again took comments only from individuals from the opposition and critics of power. Public figure Edil Baisalov believes that the lawsuits against “Zanoza,” its journalists and lawyer Cholpon Djakupova - the best final chord of Atambayev’s government. Independent journalist Bulat Satarkulov is sure that the situation when the trials pass in tight deadlines - unequivocally says that the judges received clear directives from above. “Thus, I suppose, they just want to neutralise disloyal media before the presidential elections,” the TV journalist said, “apparently, there are a lot of compromising materials and interesting facts from the past of the president’s milieu who are going to the polls. Such information can strongly influence the political situation in Kyrgyzstan. The future of the elite is at stake - to live a quiet life or to wait for troubles in the form of criminal proceedings against them. Asked whether the head of state should compete with the media and journalists, Mr Satarkulov proposed an extraordinary move. “In our case, I think that lawsuits against the media are just the opposite, losing rankings of not only the president, but also the ruling party which did not even win a majority in the last parliamentary elections, and actually failed on the local ones,” Bulat Satarkulov believes. The former owner of the “Vecherniy Bishkek” (Evening Bishkek) publishing house Aleksandr Kim shared his opinion on why the judicial and other bodies are cracking down on journalists and the media with such ferocity. Responding the Fergana question about why the Kyrgyz media did not stand up for the protection of their colleagues and a lawyer who often stood up for them, Aleksandr Kim spreads his hands with regret. Journalist Bektash Shamshiev believes that the reason for the haste of the judges is simple: to swiftly fulfil the task of the authorities to punish the uncompromising, not thinking with them in unison. Now engaged in public activities ex-Minister of Foreign Affairs Alikbek Djekshenkulov believes that the current government is making the same mistake as its predecessors. Will the authorities listen to the words of experts or not? Whatever the case, the development of events is on their conscience.